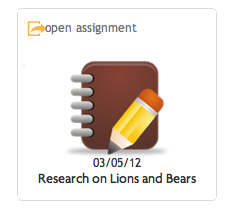 Assignments, Lions and Bears Oh My! One thing that has always been in the forefront of our minds at 19Pencils is to make the lives of teachers easier. We figure you guys have it tough enough what with all the finger pointing, test chaos, etc. As part of our effort to help you more easily navigate and share the web with your students we’ve recently expanded the functionality for what we call assignments. An assignment could be anything really, the spelling words for the week, a number of math problems, or anything else that you wish your students to complete. An assignment really is just an easy way to provide a task for students and to easily reference websites for that task in the same easy to use way as other links you’ve already saved with 19Pencils. To create an assignment simply log into your 19Pencils account, click “My Dashboard” on the top of the web page and then click “My Assignments“. If you haven’t created any assignments before you will see a description of how to create them and what they are for. Click the “New Assignment” link. Note that you can format your description to include bold fonts, colors and even bullets if you needed to provide that information to your students. Once you are happy with your title and description click “Save Assignment“. Note that you can always go back and edit it at anytime. But wait! What about the Assignment Resources section? Good question, I’m glad you asked. Resources that you add when searching, or from your “My Favorites” will show here. Read on to add website resources to your new assignment. 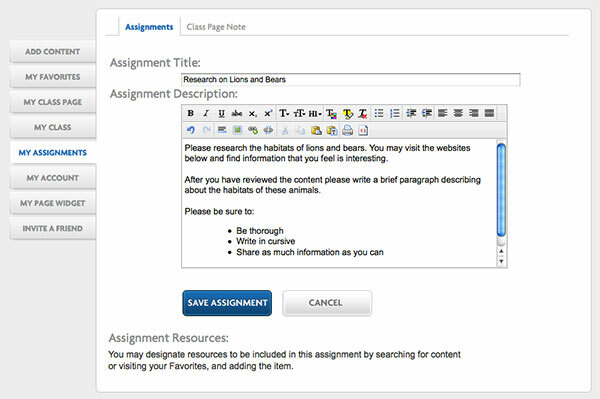 Now that you’ve created your assignment you can add web resources for your students for easy access with the assignment. 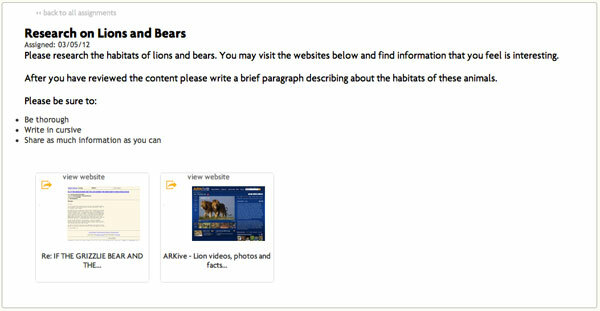 To start click the “Add Content” tab and enter a search for “habitat of lions and bears”. Roll your mouse over the “add to…” link for one of the items found that you would like to include with your assignment as shown below. Rolling over "add to.." will present a list of destinations including your new assignment. Your selected resource will now be conveniently part of your new assignment making it easy for your students. To see the new assignment and it’s added web resource visit your class page. You will see a new “Assignments” tab with an entry that resembles the one below. Your created assignment on your class page. You will see your assignment title and the date you created it. 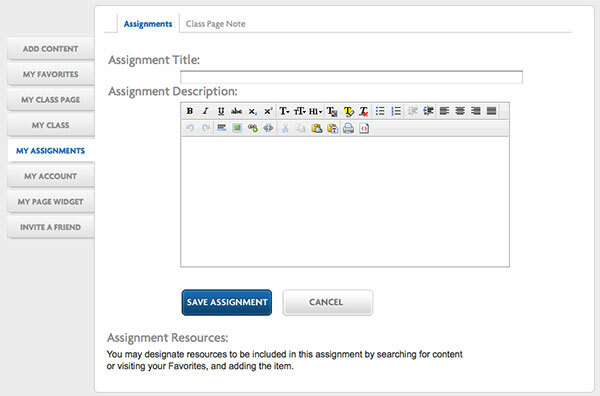 Clicking on the assignment will open it, revealing your description and the resource you included. Opened assignment with resources easily accessible for students. You can easily add more resources to this assignment, or remove resources by visiting your “My Assignments” tab in your dashboard. The web is chock full of great resources for you and your class. We hope this helps you to easily present it all to your students.